Kabbalah is a form of mysticism practiced within the Jewish tradition. 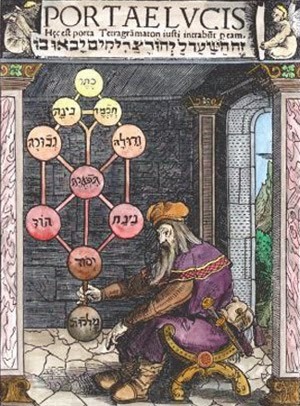 In the early seventeenth century, there was a great deal of interest in Kabbalistic teachings among Catholic alchemists and natural philosophers. It was recognized that Christian alchemy had its roots in Hermetic and earlier Arabic societies, (the word "alchemy" itself is of Arabic origin.) It was thought that the Jewish Kabbalah was yet another branch of the same traditions of relaying secret knowledge by word of mouth. He goes on to describe basic chemical operations that were thought to be fundamental to purifying materials, and ultimately to the production of the Philosopher's Stone. These techniques are the same as practiced in Christian alchemy, and Neri uses them in his glassmaking recipes. Clearly, he had more than a passing knowledge of the subject, and it is interesting to speculate on how he might have come to learn about Jewish alchemical traditions. Early seventeenth century Florence contained a city within a city: the Jewish Ghetto. A walled perimeter encircled what is now the Piazza della Republica. This was the mandated home for all of Florence's Jewish population. Each night, entrance gates were closed and locked from the outside. Within the Ghetto, residents were allowed to live and warship freely, even maintaining a Synagogue. In the daytime, the gates were opened, and residents were allowed to go about their business and leave the city with special passes. Among the Ghetto's most prominent residents was the family of alchemist Benedetto Blanis (c.1580-1647.) Blanis served as librarian to Medici prince Don Giovanni. Giovanni maintained an alchemical laboratory in his residence, which was run by Blanis, located only a short distance from where Antonio Neri was living when he first worked at the Casino di San Marco. Don Giovanni maintained a close relationship with Neri’s benefactor Don Antonio de' Medici. So close, in fact that when two of Blanis' relatives were implicated in a gambling scheme, Don Antonio hid them at his residence and then spirited them away, out of Florence, in his own coach until matters cooled off. Furthermore, Blanis came from a family of doctors who must have been known to Neri's father, royal physician to Grand Duke Ferdinando. Antonio Neri was probably a couple of years older than Blanis, if they did not meet through mutual connections with the Medici family, then perhaps they met on the street. The walk for Neri, between his living quarters near Santa Trinita, and the Casino laboratories would have passed around or through the Ghetto, and the walk for Blanis to Don Giovanni's palazzo on Via Parione took him past Neri's front door. The paths of the two men may have crossed, but there is not direct evidence. * “Discorso sopra la Chimica: The Paracelsian Philosophy of Antonio Neri”, M.G. Grazzini / Nuncius 27 (2012), p. 337. For more on Blanis, see Edward L. Goldberg, The Secret World of Benedetto Blanis. (2011). ** This post first appeared here on 6 January 2014.